Get ready to create memories you’ll never forget while entertaining with this modernized classic, the Tiki Bar Swivel Barstool by Panama Jack. Utilizing premium materials, this swivel barstool features a powder-coated aluminum frame that is able to survive extreme weather and climates. Hand coated in an Antique color finish, this swivel barstool features tapered legs and a slightly curved back, along with a swivel mechanism that allows for smooth movement. Anchored by the supportive frame, the seat provides added cushioning with Sunbrella fabric, available in your choice of color. 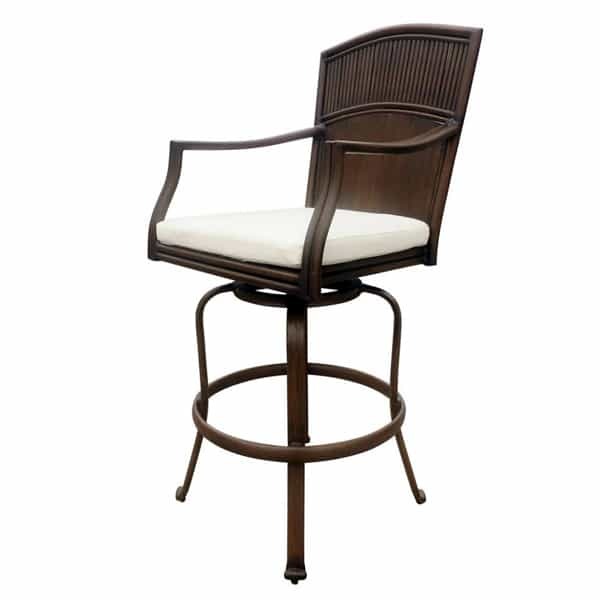 Enhance your outdoor space with the durable, yet elegant Tiki Bar Swivel Barstool by Panama Jack. These items require freight delivery. This shipping method uses a full size semi-truck and product will be delivered to a street-side location (threshold) or into a room of choice (white-glove), based on the level of service requested. A representative will call the day before delivery to setup a time - a signature is required upon receipt. This item will ship the next business day - if there is any delay, a representative will contact the customer immediately. Special order patio furniture ranges from two to six weeks, depending on the manufacturer. For special orders, call 877-775-3478.